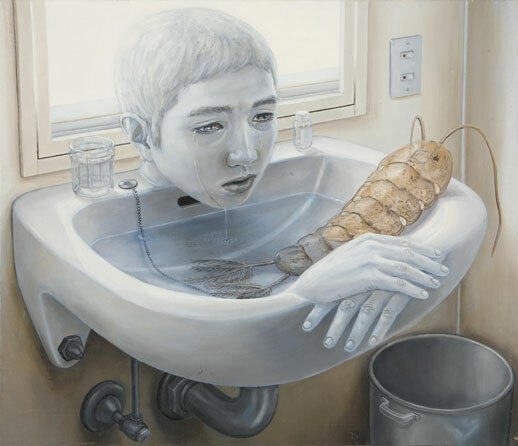 Tetsuya Ishida lays bare the undiscussed dark side of life. Imagine… an employee out with his coworkers celebrating, but has nothing to be joyous about. A man sharing his body with a woman and yet there is no intimacy. A child standing in the middle of a crowded school yard, and yet he seems alone. These are situations that people often find themselves in every day, but are too ashamed to discuss. Society conditions us from a young age to share things with others, but usually only if they are good. When it comes to expressing the negative sides of life, people are usually at a loss for words, often trying to find ways to soften their explanations to others. Tetsuya Ishida (1973 – 2005) defied this norm. Forthright in his thoughts and in his views of the darker side of human existence, he unreservedly painted them onto canvas. With just sixteen works on display, the rawness of Ishida’s expression permeates the room. In this exhbit, Ishida often portrays people as lifeless robots, persevering without maintenance, never questioning whether or not their actions carry any value. One painting (the title of which roughly translates as ‘Cell Phone Robot and Laptop Boy’) depicts a rusted giant robot business man with two cell phones for ears; smoke billows out of grilles in his suit pocket as he runs, suggesting he is pushing himself beyond his ability and headed towards breakdown. Set to a gloomy brown sky with a rollercoaster in the background, the robot has another business man sitting on his shoulders, using a laptop. In addition, Ishida’s work explores the theme of loneliness, frequently portraying the paradox of people being physically next to each other, and yet emotionally distant from their companions. In Sesshoku (‘Contact’) a man with the body of a small construction machine sits in the middle of a table of izakaya food. His expression is forlorn as he mindlessly pours beer for an unseen companion, presumably a coworker. 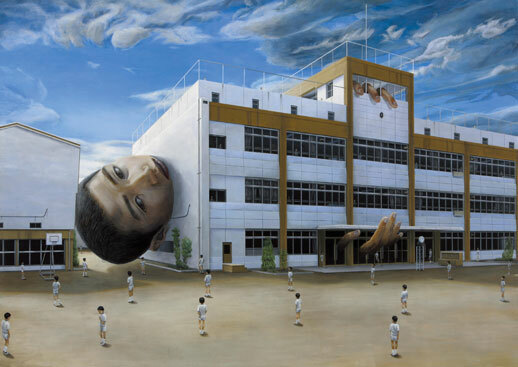 Shuujin (‘Prisoner’) depicts a giant boy trapped in a school building. While he is surrounded by other students and teachers, they all appear as though they are standing alone. Datai (‘Abortion’) shows a man sitting on the edge of his bed, next to a woman in her underwear. Instead of the floor, his bed has a stream running underneath. With their backs towards each other, the man stares into the stream under his bed where his dead baby lies. Moreover, Ishida’s uses a combination of elements not usually associated with one another for a shocking effect. In one painting, a boy sits on his ‘bed’, listening to music, but the bed is in fact a grassy grave, complete with a head stone, incense and a dead body underneath. In Shuushuu (‘Collection’) a family is depicted at a funeral, but instead of a casket, there is a maintenance worker disassembling the dead man and putting him into a cardboard box for a computer or television. “A Little Exhibit” serves as a good way of whetting one’s appetite to Ishida’s style, which can be explored further in the book of his work on sale at the front desk. In spite of the small number of paintings on display, the fact a person can leave feeling both challenged by the work and familiar with the mindset of the artist himself is a clear indication the artist was adept at what he does, and the exhibition was well organized.